Marina's Bird's Milk Cake - Let the Baking Begin! Moist Chocolate Cake filled with Luscious Custard Cream. The layer of Extra Glossy Chocolate Ganache on Top Brings this Cake Over the Top – just the way any Chocolate Cake Should Be. Easter’s coming up and everyone’s looking for that one great recipe of a cake that will just blow everyone away. You’re in luck today because I think I’ve got just the recipe for you! The moistest chocolate cake, filled with silky custard, covered in drizzling chocolate ganache glaze & topped with fluffy mounts of custard lightened with whipped cream. Oh and one more drizzle of chocolate on top! I have been wanting to make this cake, for-eeveer! My aunt has been making a variation of this cake (finally posted it HERE) for pretty much every family celebration we had in the last… at least 2 years. Then I found Midnight Sin Chocolate Cake by Not so Humble Pie. Her recipe produced such wonderfully moist and delicious chocolate cake, that I knew I had to do something with it. That’s how an idea, to combine her Chocolate cake & the custard from my aunt’s cake into one. When you combine the two, something magical happens. 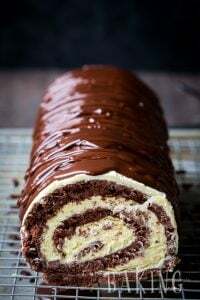 The custard combined with the chocolate cake makes for an incredible combination, but when the cake is left alone for a day, the custard gives off moisture to the cake, making the already moist chocolate cake even moister. It’s almost fudge-like when you bite into it. This cake is definitely going into my recipe box as a favorite! For this recipe, I have tried to make a little video tutorial on how to decorate the cake, because describing it, while possible, is not as effective a seeing it. So let me know how you like it! Combine egg yolks and sugar in a medium-sized pot and whisk until smooth. Add milk and whisk again. Cook over medium heat, constantly stirring until it begins to thicken and covers the back of the spoon. When you run your finger over the back of the spoon, the custard should not run into wiped space. Add vanilla extract & stir. Add butter to the custard and stir until butter is completely melted and incorporated into the custard. Cover with plastic wrap, touching the custard (to prevent forming of skin) and allow to come to room temperature. In a cup whisk together eggs, egg yolks & sour cream. Set aside. If you have espresso powder, combine the espresso powder with the boiling water. Or brew 2 tablespoons of ground up coffee with 1 cup water. Drain coffee and make sure there’s 1 cup of liquid. If there’s not, add enough to make 1 cup. Set aside. Combine sugar, cocoa powder, salt & baking soda with the espresso boiling water mixture and stir until almost no lumps appear. Cook over medium high heat, constantly stirring until it comes to a boil. This step will make the darkest chocolate color it can be. Remove from heat and allow to cool for 10 minutes. Add the chocolate mixture to the mixer and with beater blades, beat on low speed for 2-3 minutes, to remove additional heat from the mixture. Add oil & vanilla extract and beat until combined and smooth. Add flour and beat again until smooth. Add the egg mixture and beat until combined once more. Try to use minimal amount of beating after the flour is added, we do not want any gluten development as it will make the cake gummy. 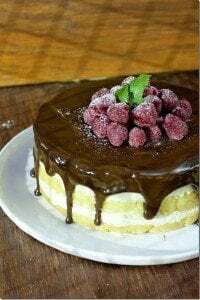 Pour batter into 2 9 inch round cake molds lined with parchment paper & sprayed with non stick spray, or if you do not have the non stick spray, butter the pan, add 1 tbsp flour then shake around to cover the pan, shake out the excess. Put on wet cake strips around the pan. This will make sure the cakes rise evenly so that we do not have to level the cakes after they bake. Bake in preheated 350F oven for 25-30 minutes or until a toothpick inserted in the center comes out clean. If using an 8-inch cake mold, add 5-7 minutes to the baking time. Once baked, remove from oven and allow to cool for 5 minutes. Then, run a knife around the inside of the cake mold and unmold the cake by turning it over onto a cooling rack. Remove parchment paper and allow to cool completely. Cut each cake horizontally into 2 layers. This will ensure maximum absorption of the custard once layered. See the rest of interactions in picture from below, or scroll all the way to the bottom for a video. Place the first cake layer in the middle and tighten the adjustable cake ring around the cake. Put second cake layer on top, press it in, then alternate cream & cake until all cake is used up, and you have about 1.5 cups of frosting left over ( the video says 2, but I think it was more like 1.5 cups). Refrigerate leftover custard until further instructions. Refrigerating the cake overnight will prevent the cream from running out the sides and help with further decorating. Combine leftover custard & 8 oz of whipped topping or 1 cup of whipped heavy cream. Carefully fold it together until well combined. Cover the cake with frosting, smoothing out the sides and top with spatula and a scraper. Fit pastry bag with a star tip. Drape the pastry bag over a tall glass and fill it with leftover Lightened Custard. Twist the end and put upside down into the glass. Leave in fridge until we need to use it. Make the Ganache, following this recipe & instructions. Pour about 1/2 of ganache in the middle of cake, bring it closer to the edges with spatula, then add the other half, reserving only about 1 tablespoon for later. Or, instead of looking at pictures, watch a video of how you to decorate this cake. Black Forest Cake – Chocolate cake with a sweet cream and cherry filling. 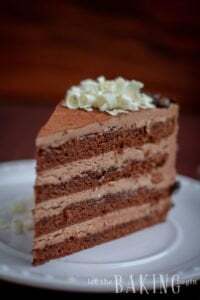 Russian Royal Cake – Cake made with walnut, poppyseed layers with a dulce de leche buttercream. 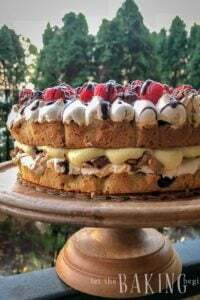 Bird’s Milk Cake Recipe – Soft sponge cake layers and a smooth custard buttercream. Combine 15 egg yolks and 1 cup sugar in a medium-sized pot and whisk until smooth. Slowly add 1 cup hot milk while continuously whisking. Cook over medium heat, constantly stirring until it begins to thicken and covers the back of the spoon. When you run your finger over the back of the spoon, the custard should not run into wiped space. Add 1 tbsp of vanilla extract & stir. Do not overcook or the custard will curdle. Add 400 grams of butter to the custard and stir until butter is completely melted and incorporated into the custard. Cover with plastic wrap, touching the custard (to prevent forming of skin) and allow to come to room temperature. Egg mixture: In a cup whisk together 2 eggs, 4 egg yolks & 1/4 cup of sour cream. Set aside. Make the espresso: If you have espresso powder, combine the espresso powder with the boiling water. Or brew 2 tablespoons of ground up coffee with 1 cup water. Drain coffee and make sure there's 1 cup of liquid. If there's not, add enough to make 1 cup. Set aside. Combine 2 3/4 cups sugar, 3/4 cup cocoa powder, 1 tsp salt & 1 tsp baking soda with the espresso boiling water mixture and stir until almost no lumps appear. Cook over medium high heat, constantly stirring until it comes to a boil. This step will make the darkest chocolate color it can be. Remove from heat and allow to cool for 10 minutes. Add the chocolate mixture to the mixer and with beater blades, beat on low sped for 2-3 minutes to remove additional heat from the mixture. Add 1 cup oil & 2 tsp vanilla extract and beat until combined and smooth. Add 1 3/4 cups flour and beat again until smooth. Add the egg mixture and beat until just until combined. Pour batter into two 9 inch round cake molds lined with parchment paper & sprayed with non stick spray, or if you do not have the non stick spray, butter the pan, add 1 tbsp flour then shake around to cover the pan, shake out the excess. Put on wet cake strips around the pan. Bake in preheated 350F oven for 25-30 minutes or until a toothpick inserted in the center comes out clean. If using an 8 inch cake mold, add 5-7 minutes to the baking time. Cut each cake horizontally into 2 layers with a long serrated knife. Line edges of the serving platter with 4 strips of foil for each cleanup. The pieces must be wide enough to go about 1/2 inch under the cake and cover the edges of the platter. Take away about 1.5 cups of cream before you start to layer the cake with the remainder of it. Place the first cake layer int he middle of the platter and tighten the adjustable cake ring around the cake. Add a couple tablespoons of the cream and spread it around. Put the second cake layer on top, press it in, then alternate cream and cake until both are used up. You want your last layer to be the cake. Run a thin knife around the inside edge of the cake ring to loosen the cake. Remove the cake ring. Combine the reserved 1 cups of custard with 8 oz of whipped topping or 1 cup of whipped heavy cream. Carefully fold both together until just combined. Cover the outside of the cake in this cream in a thin layer, smoothing the top and sides. Refrigerate the cake for 15 minutes. Fit a pastry bag with a french star tip. Fill it with leftover Lightened Custard. Refrigerate until ready to use. Reserve 1 tablespoon of ganache. Put it in a ziplock bag and set it aside. Pour the ganache over the cake carefully brining some of it close to the edges, allowing for it to drizzle down the sides. Pipe stars all around the top of the cake going in rings starting from the edges and working towards the middle. Snip the corner off the ziplock bag with the 1 tablespoon of ganache and drizzle over the piped stars. Refrigerate the cake until ready to serve. Moist and delicious. Perfect for a boston cream fan. Appreciate your comment so much! Truffle Cake Recipe - Let the Baking Begin! I attempted the batter twice and both times it turned out as more of a gooey brownie than a cake. Despite being in the oven for nearly 45 minutes each time, it just wouldn’t cook through for me. The custard however was fantastic. So we just ended up calling it an “Easter Brownie” instead of a Bird’s Milk Cake. I want to make this next month for my daughters birthday. Is there a way to print just the recipe? It will be 52 pages if I try to print out as shown (with pictures and the end between adds) Help please! I will keep it on my calendar to fix it by next week, so you can print it. If you could do that for me would be wonderful! Thank you so much for your time! All done 😀 From 52 pages down to 3! Thank you again, she is going to love it! Well, I think we all will! Is there any way to print out Marina’s Bird’s Milk cake recipe without all the adds and extra pictures? It said it was going to be 52 pages on my printer! I don’t have room on my kitchen counter to have my lap top while trying to make this cake, but want to make it for my daughters birthday in November. can this be made in a 9x13in cake pan? Do you have a 9×13 cake ring to assemble the cake in? The frosting in this one is pretty runny so you will need some kind of a ring to assemble it in. If you do have a 9×13 cake ring, I would double the recipe if you still want it to be the same height as the pictured cake. 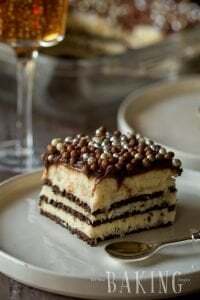 Also, as an alternative option, bake the cake layers from this recipe and use the frosting from this cake here – Bird’s Milk Cake (CUSTARD BUTTERCREAM). The frosting from this other cake is pretty much the same ingredients, but because you use room temperature butter and not melted butter, it comes up stiff enough to frost the cake without the cake ring. If you double the cake portion, make sure to double the frosting as well. Can I make the custards 1 day ahead ? This is look beautiful and scrumptious. Thank you. Yes you can, just refrigerate it until you’re ready to use it. I’m just confused about the amount of butter in the custard. 400 grams is 3.5 cups, right? That just seems like a bit much to me. Thank you! It is 400 grams, since this is in a way runny buttercream – meaning that you could whip room temperature butter and gradually add the custard and you would get custard buttercream. Hi Marina, what will be the measurement if I will do it with 12″ x 3″ aluminum pan? Looks delicious, I’m trying it this weekend. This looks amazing! I was wondering how much custard this recipe yields. My husband LOVES Birds Eye Custard and I was hoping to just use it instead of the recipe you’ve provided (this also saves me on eggs). Thanks! Can’t wait to make this cake!!! This recipe makes about 5 cups of custard. Marina, it worked. I will note the consistency was NOT the same so it looked like a total fail but the cake was DELICIOUS!!! I will be attempting this again with your custard recipe though. Thank you soooo much for sharing. My normally cake hating husband was very pleased! OMG! I made this cake over the weekend for our anniversary.I love custard and chocolate like crazy. My first chocolate cake, it tasted absolutely delicious. The hubby kept saying it’s really good, it’s really really good. Thank you so much for an amazing recipe. This will be my go to chocolate cake recipe here after. Hello! this looks delicious but would it be a problem or effect the taste to drastically if i were to leave out the espresso and coffee or substitute it with some thing else? You can leave it out, just make sure to replace it with warm water. The espresso is to intensify the flavor of the chocolate, but you can’t really taste coffee in the cake. thank you fir the recipe, I can’t seem to find the printable version. Hi, when did you say to add the espresso again? I don’t see it in the steps? Is that the boiling water? Thank you. I tried to make the cake and once I took it out of the oven it fell and pretty much turned into a brownie. What am I doing wrong? I’m sorry you had trouble 🙁 Unfortunately, I’m not sure what could have gone wrong. The cake settles a little bit once out of the oven, but I wouldn’t say that it collapses. Hi Marina, wow what a beautiful presentation. I love how you decorate your pastries and cakes! What pastry decorating tips set would you recommend for those of us just starting out? Hello Marina,For How Many People This Cake Is? Depends on a group, but usually a 9 inch cake is cut into 6-9 pieces. I wanted to ask what brand of flat scraper do you use? In this post I use 2 scrapers, the first one is a Nonpro Stainless Steel Scraper and the second one is the Ateco Decorating Comb . I’ve been eyeing this cake since it’s been posted and made it this week for a colleague that is leaving. While each of the components turned out tasting heavenly, nothing worked quite right for me. *My custard was not entirely smooth (though the itsy bitsy lumps weren’t noticeable in the final product) and didn’t thicken up quite like I expected. The flavor was on point, so I didn’t care too much. *The cake – I baked mine in 9 inch cake rounds with cake strips, not in springform pans like your pictures show. No problems getting the cakes out of the pans, but they did not bake properly. I’m not sure if it was because the pans were too small (I was definitely worried the batter was going to overflow during baking) or if it was an issue from the magi-cake strips, but I baked my layers for about 40 minutes and they were still not done the whole way. It seemed like they didn’t rise as much as they should have, either – I would definitely go with springform (or a higher-walled set of pans) if I attempt this exact recipe again. The flavor of the cake was out-of-this-world-chocolatey and awesome! The texture just wasn’t right, and I think a lot of that had to do with the cake strips. Moist as could be, but not right. I’m still getting the hang of the strips. *For the lightened custard, I combined my remaining custard with 8oz of whipped heavy cream. I must have been impatient and didn’t whip my cream long enough, because there’s no way that my lightened custard would have been pipeable. *After not being able to pipe stars on the cake, I didn’t bother making the ganache (and the cake was so rich that I don’t think anyone noticed it missing) but have the recipe jotted down for use with another cake I like. All in all, it is a delicious, rich and chocolatey creation that is just WONDERFUL, but I’ll be sure to use deeper cake pans (or another proven chocolate cake recipe from my arsenal) if I try this again. Thank you for the tasty recipe, Marina! It has definitely inspired me. Oh – and I didn’t have any problems assembling my cake with my springform ring instead of a cake ring – I was just very careful when spreading out my custard. Now, what to make with all these egg whites…? The custard – I think you overcooked it, so it became thin again. The custard is not to be boiled, but heated until it thickens slightly. The eggs curdle creating little bits and pieces if you overcook it. If you do try it again, only cook until you can make a streak on the spoon that doesn’t flood back. Lightened custard – Yeah, you do have to whip your heavy cream until proper consistency or it’s not going to work. But, if it still keeps being runny, just make more heavy whipped cream and keep adding it until the cream is light and fluffy. Dear Marina, thank you for the wonderful recipe! I am really looking forward to baking this cake. You write in the recipe “1/4 sour cream or buttermilk”. Do you mean 1/4 cup? Thank you Betty! And yes, it’s cups. Thanks for catching that one, I already corrected it in the recipe. Sorry this recipe has no print version, so you can just highlight the recipe itself, then click print and choose option ‘highlighted text’ to print only the part with the recipe and not the foreword before it. This cake looks so moist and delicious. I will definitely give it a go for a special occasion . This cake looks so devine! Keep it up girl! I am excited about making this cake. I am confused about the 100 mlx heavy cream for the Ganache though. Can you explain? Hi! This cake looks delicious… do you think this would hold at all under fondant?? Planning on making this for my husband’s birthday. We are eating at Buca De Peppo, do you think I should ask them to refrigerate the cake until we get to dessert? Awesome! Thanks for getting back to me so soon! I made this chocolate cake but with a basic custard filling+extra creamy cool whip and cherries, like a black forest cake. This chocolate cake is super moist! I didn’t even need to wait for the cake to soak up the cream, could eat it right away. Great recipe. Thank you for sharing. Hi, I am so tempted to make this cake as it looks really scrumptious. Just a quick question that is there any other recipe for custard filling that will work as my husband can’t tolerate so many eggs and the recipe is asking for approx 20 eggs. Thanks a lot! My frosting is a bit thin and wont hold shape to do the top. How can I correct this? Was the custard and the whip cream chilled before combining? Depending on how thin it is, you might want to add more whip cream until it holds shape. Oh wow Alena! Thanks for such wonderful comment! It is because of people like you that I still continue to post recipes! Thank you! It’s right before the third set of pictures within the instructions. You add it to the 1 cup boiling water. That’s so awesome! Happy Mothers day to your mom! Thanks for your feedback! Hello dear! Can I replace the cake rings with a 9 inch springform? Or it’s not the same? Somebody did this on Instagram and they said that there’s too much space left between the cake & the springform so the cream oozes out. But, if you want to, you can add 2 tablespoons flour to the milk when you make the custard and it will be thick enough that you will not need springform. It will be a little bit different texture (check out my last picture of this cake on Instagram) but nevertheless good. Great video! Beautiful cake! I can almost taste it. Thank you for continuing to share your amazing recipes! You’re welcome, I truly enjoy doing this, so knowing that people appreciate my work makes it even more worth it 🙂 Thank you! OMG Marina you are completely off the hook! I think I love you! This is an amazing cake!! I was going to make your Napoleon Cake for Easter. NOW I’m confused and I can’t think any more.You bewitched me. Napoleon or Bird Milk? Um…BIRD MILK! ALL HAIL MARINA!!! ABSOLUTELY STUNNING! Don’t even think I can find a cake as awesome as this in any bakery. 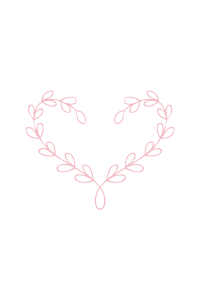 Thanks for keeping such a beautiful blog! Thanks Steph so much for your wonderful comment!